I awake at five in the morning to the sound of heavy, fast raindrops on the hotel window. My weather app glows in the dark room: 100 percent rain, 35 degrees, 30 mile per hour winds. Today is April 16, 2018. I am about to run the Boston Marathon. At the start line I hug my cousin Allen, a seasoned runner, who should have started in wave 1, corral 1 with the elite runners. Instead, Allen is running with me due to a quick training season coming off a foot injury. I’m beyond grateful to have him by my side. We weave in and out of runners cloaked in full body ponchos, dodge massive puddles, grit our teeth through the head winds while the freezing cold, driving rain soaks us to the bone. The smile never leaves my face. This is the Boston Marathon. We compare the pace on our watches at every mile, laugh through the downpours, push up Heartbreak Hill, share runner fuel, exchange encouraging words. When the winds flare up, Allen motions for me to get behind him, acting as a human shield, literally blocking the head winds with his body. After a torrential downpour at mile 22, I grow a bit weary. This is the hardest part of a marathon, even in good weather. “Allen, set the pace. I will follow.” He jumps in front, settles in just under a 7:45 minute pace per mile. It’s hard. I can’t look at the cheering spectators or soak in the magic of this race anymore. I must use all energy to propel my body forward. Deeply focused on the heels of Allen’s feet all the way to Boylston Street, I say to myself you can do this. You can do this, Helen. You will do it. Side by side, we push as hard as we can down the last long stretch, striding arm in arm across the finish line at 3:25:14, a one minute PR for me. Later that night, I reflect on how adaptability and mental strength carried me through the epic day. Two days later, I walk into my office with a to-do list. The entire day mapped out according to plan – the people I will call, brief I will write, discovery I will finish drafting. About five minutes into the morning, my day is not going as planned. Three people tell me six things that all need to happen immediately. I haven’t even ticked off the first “to-do” on the list I optimistically created moments earlier. My chest tightens. I start to feel anxiety creeping into my core. You can do this. You can do this, Helen. You will do it. I can do it. And I will. You know why? Because running has taught me the art of adaptability, power of mental strength and value of community. This is why I’m convinced that being a runner makes me a better lawyer. So you’ve decided to run a marathon. You make a training plan. For three to four months you run five to six times per week, eat healthy foods, invest in quality running gear, maybe you even buy a nice watch that tells you calories burned, miles run and heartrate. It feels as if you are in control. But as you approach race day, there is one big thing completely out of your control – the weather. Runners at every level fret about race day weather. Will it be too hot? Too cold? Rain? Wind? One thing is for certain – the weather is out of your control. You know what else is out of your control? Juror #4 slept through the entire morning of your client’s testimony and you only realized it five minutes ago. Your witness is on the stand telling a completely different story than she told you in the office last week. Don’t even get me started on the fast one opposing counsel pulled during motions in limine. I literally laughed out loud during Boston because the weather was so ridiculous. How could this be my race day? Then I remembered the 15 mile training run back in February when the headwinds felt like trudging through packed sand pushing 150 pound wagon of bricks. I thought about the 20 mile run when it poured halfway through and I struggled to pick up my heavy, wet feet. Oh, and that day in January when my crazy running group decided to do a speed workout in freezing cold rain. You’ve trained in wind. You’ve trained in rain and cold. You can do this. Dig deep. Adapt. As runners, we use our experiences during training to prepare for and adapt to whatever race day brings. In the courtroom or the boardroom, lawyers must do the same thing – prepare and adapt. In the early morning before the sun rises, I run. I do not take music with me. This is my time. I use it to focus on thoughts or issues I’m working through in my life. If I have a brief, hearing or deposition coming up, I use this time for creative strategizing. Or I just enjoy the silence. I love my job as a trial lawyer because it’s challenging and keeps me on my toes. But some days, I feel that I have so much to accomplish in an hour, a day, a week. I find myself taking deep breaths and chanting, I can do this, I can do this, I will do this. The chanting does not make the work go away, but it makes me feel better and a little more confident about my ability to perform. Can you guess where I learned this trick? Mental strength is a muscle that needs exercise just like muscles of the body. One hot, humid Sunday morning a couple Augusts ago, I set out for a long run. About a mile in, I noticed I was running significantly faster than my usual pace. Can I keep this up the whole time? And then, this thought popped in my head. If I can, I will. That fall, I ran the City of Oaks Marathon in Raleigh and qualified for Boston. The mantra’s been with me ever since, both in sport and profession. Running forces me to strengthen my mental toughness. I use that mental toughness every day of my career. Sometimes it comes in the form of positivity or patience, other times it’s that coaching voice cheering me on to finish a task. No matter how many years you’ve been practicing law, mental strength is a muscle that needs exercise. We all need the ability to say whatever this day brings, I can do this. I will do it, and know those words are true. It’s inevitable. If you run, you’re a runner and if you’re a runner, you are part of a community. On my high school cross country team I learned the significance community. The value of having people in your corner. You need to surround yourself with people who love you and encourage you to chase down your goals. Be that person to others. 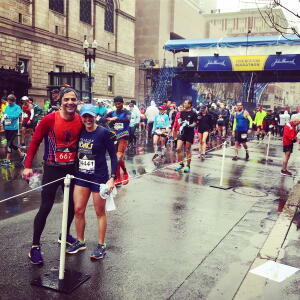 No way I would have run my fastest marathon in Boston this year without my cousin Allen supporting, encouraging and leading me to the finish line. Training would have been dull and less inspiring without my TriYon team of runners who push me at speed work every Wednesday morning in Charlotte. I look forward to events like the Blue Ridge Relay (208 mile relay through the Blue Ridge Mountains) where I get to run with a team. In the same vein, I see my colleagues and office staff as teammates. It’s easier when you work on the same side of the isle. But at the end of the day, we are all part of the legal community. I like to think of opposing counsel as that runner coming down the stretch with me, neck and neck, to the finish line. Sometimes I win, sometimes she wins. We always shake hands at the end. I respect her and I want her to succeed. If she is succeeding, I am succeeding. Without her, I would not run as fast or work as hard. She is a runner, and thus, part of my community. I believe there’s a little fire inside all of us, but some just haven’t tapped into it yet. We all need an outlet. Running happens to be mine. What is your outlet? Is it something that pushes and inspires you? What gives you the opportunity outside of your job to adapt, strengthen your mind and be a part of a community? As a runner and a lawyer, I am always learning and forever chasing the next goal. Adaptability, mental strength and community are just a few things I’ve gained from running and serve me well in my career. 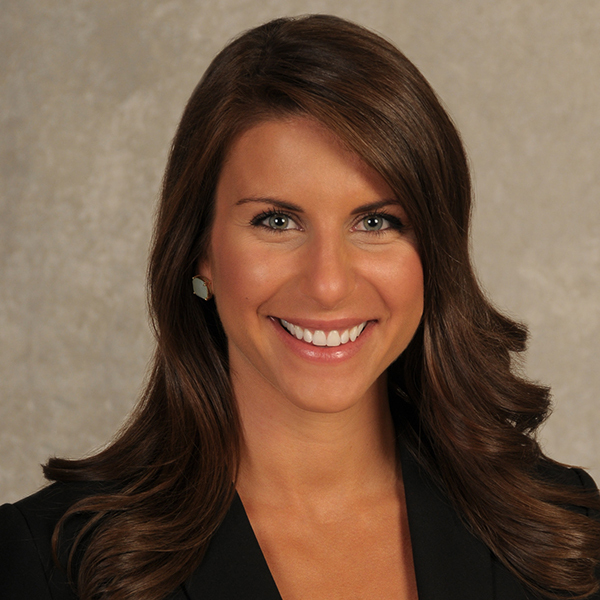 Helen S. Baddour is an attorney at Charles G. Monnet, III & Associates in Charlotte, NC. She has run five marathons and over a dozen half marathons. You can find her creative outlet @chasinghelen on Instagram or chasinghelen.com.